Do We Really Need Jessica Simpson’s Semi-Autobiographical NBC Comedy? The Hollywood Reporter reports that Jessica Simpson is set to star in a semi-autobiographical comedy for NBC. It also says that the currently unnamed magnum opus will be written by Robin and Nick Bakay, the geniuses behind Paul Blart: Mall Cop and the Fox sitcom ‘Til Death, which magically lasted 4 seasons. Only two episodes into the series, Go On has already exceeded expectations. When Matthew Perry says that the show has heart, he means it. His character, Ryan King, just wants to grieve his wife’s death and help people at the Transitions therapy group in the process. 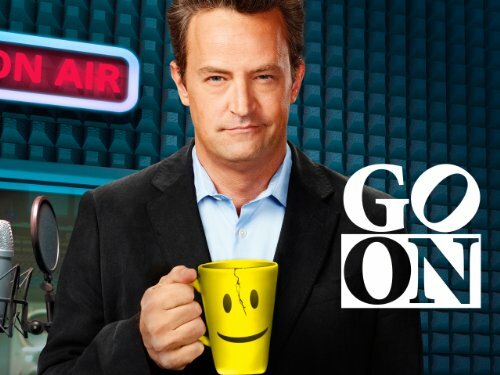 In the second episode of Go On, viewers find out that Ryan forces his assistant, Carrie, to work late just so he does not have to go home to an empty house. Carrie is clearly worn down because she has not had a social life in weeks. She wants to help Ryan, but needs a life of her own. When Ryan finally allows Carrie to have a social life, he invites himself to Carrie’s girls’ nights out. Ryan clearly has problems that he should not be imposing on Carrie. However, the man just lost his wife, so it is hard to get angry with him. Eventually, Ryan and Carrie set boundaries. Animal Practice… Worth the View or Just a Zoo? As anyone who has ever been to a theatre knows, nothing is ever on time. Because the Olympics wasn’t over by 10:30 last night, the Sneak Preview of NBC’s Animal Practice was pushed back 20 minutes. When it started, I was left wondering if it was worth NBC finally cutting time out of the Closing Ceremonies to see it. Justin Kirk plays Veterinarian Dr. George Coleman who is good with animals, not so good with the owners. When the woman who owned the animal hospital George works in passes away, her granddaughter, Dorothy Crane, takes over. Crane, played by Joanna Garcia-Swisher, also just happens to be Dr. Coleman’s ex-girlfriend. The main human-centered storyline of the Sneak Peek episode is that after the owner of the hospital dies, Dorothy takes over and tells George that they can keep the hospital running without it being too awkward. Other important story line centered around a dog that swallowed something and needs surgery to remove it. The owner isn’t happy that the surgery will cost two-thousand dollars and demands to put the dog down despite the fact that it would destroy his young daughter’s happiness. George, angry with the owner, takes the dog and proceeds to hide it. He plans to do the surgery anyway despite the consequences. The funniest episode of The Fresh Prince of Bel-Air is probably the one guest starring William Shatner. Unfortunately, there is not a good video online of the scene where Shatner, Will, and Carlton are at the dentist high on laughing gas. However, there is a good copy of the bar scene, which causes that visit. While the scene is not hilarious as the dentist one, it is still funny. NBC hit a home run with Go On. The show stars Matthew Perry as sportscaster Ryan King, whose boss forces him to join the Transitions therapy group. Of course, Ryan feels that he does not need therapy and any attempt to convince people to agree with him fails because he keeps lashing out at everyone. For those who insist on making Friends comparisons, Ryan is Chandler Bing, if Chandler Bing suffered from clinical depression and was constantly sardonic. It is a little jarring at first, since Friends is still being rerun continually, but it works. Ryan’s first Transitions’ meeting makes up a big part of the pilot episode. When he first arrives, Ryan takes his place in the circle and listens briefly to some of his fellow group members’ problems. He quickly gets fed up with the wallowing because everything in his life is a competition. Deciding to do something about this, Ryan pulls out a whiteboard and starts making a bracket that one of the group members dubs “March Sadness.” For someone to progress in “March Sadness,” they have to tell their sob story in 5 seconds and it has to be more depressing than their competitors. It is twisted that Ryan turns suffering into a competition, but for some reason it does seem like a feasible way to move on in one’s life. The winner was a Fausta, a woman who spoke mostly Spanish and lost both her husband and her son. As the winner, Ryan crowned Fausta with a pastry box that she now cherishes. Thursday’s episode of Sullivan & Son was enjoyable at times, but very little actually happened. Since the bar seems to be the only major setting, there is hardly any action. Instead, the characters are free to have very stressful conversations. While this leaves possibilities for the characters to have revelations, there is very little effort to move the story forward. Episodes that are full of dialogue can be funny at times, but they can also get boring. Despite the potential for Sullivan & Son to be humorous as well as deeply thematic, exclusively relying on slow moving episodes that are full of stress can be a bad idea. It is the 50th anniversary of Sullivan & Son and things are getting complicated for Steve and his childhood friend Melanie, known as Mel. It is revealed that Mel’s grandfather originally owned the bar and lost it in a poker game against Steve’s grandfather, Jack. Despite this having nothing to do with Steve, Mel holds a grudge for some reason. Of course this is illogical and Steve had nothing to do with the loss of the bar. Mel acknowledges this and is still mad at Steve. Mel’s acknowledgement of her own hypocrisy is supposed to be funny but it is actually very annoying, There is absolutely no reason for this to be a story. In fact, neither of them were aware of it until Jack brought it to their attention. The fact that it was a plot line shows the drawbacks of relying on one location for an entire episode. Today’s video is an Inside Look at a well-known Seinfeld episode, which is included as a special feature on the first DVD box set. The episode, “The Chinese Restaurant”, is from season 2 of Seinfeld and is widely regarded as the show’s first “classic” episode. The half hour revolved around Jerry, George, and Elaine waiting to get a table at a Chinese restaurant so they can make it to a movie. This was the first episode of Seinfeld that placed such a heavy emphasis on the minutiae of daily life. As the video will tell you, NBC did not want this episode produced. They thought it was going to bomb. Seinfeld had yet to come into its own and the network didn’t want the show to take such a risk. Little did they know, “The Chinese Restaurant” would go down as one of the greatest episodes of one of the greatest sitcoms ever. Unfortunately, embedding has been disabled, so click through to see the video. It will be worth it.